Major League Soccer just had the greatest week in its existence. An open and exciting weekend of league games featured a 7-goal thriller in Chicago, expansion side LAFC (coached by only the best American coach of all time) winning their second straight conference road match by obliterating Real Salt Lake at Rio Tinto, and Atlanta United packing a cool 72,000 people under their dome in a win against D.C. United. Then, those rested Red Bulls starters put their 3rd, 4th, and 5th goals past Club Tijuana in the second leg of their CONCACAF Champions League quarterfinal, knocking out the defensively stout Xolos (who had only allowed 7 goals all season in Liga MX). Later Tuesday night, Toronto FC rode their away goal and some all-but-otherwordly Giovinco majesty to oust Tigres. At the time this article was written, Seattle Sounders had a one-goal advantage on their way to Guadalajara to try for the MLS continental trifecta. The Union had a bye week because of the Sounders’s midweek match and thus took a backseat to the league’s narrative. They return on Saturday against the surprising Columbus Crew. The Crew may be in their last year of existence, bound for the greener pastures of Austin, TX. If that’s the case, the team are certainly kicking their final season in Ohio off with a bang. After nearly making the MLS Cup final last season, Columbus moved on from notable contributors Justin Meram, Ola Kamara, Kekuta Manneh, and Waylon Francis. Mike Grella, Ricardo Clark, and Gyasi Zardes took their places in the team’s 4-2-3-1. Zardes in particular, formerly of the LA Galaxy and eternally of cringe-worthy first-touch compilations, has suddenly becoming the league’s hottest striker. Their opening weekend win in Toronto is worth all three of its points and its market value weight in gold. 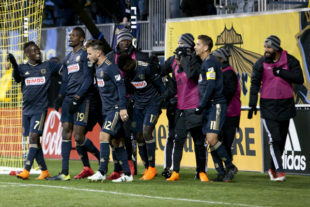 To follow that up with a come-from-ahead victory over visiting Montreal should put the Union and the rest of the Eastern Conference on notice. Injury report: Mike Grella (OUT), Gaston Sauro (OUT), Josh Williams (Questionable. The Union’s win against nine-man New England was a tidy victory made somewhat more impressive by the Revs’s rebound win in Colorado last weekend. The story in Week 1 was all about the debuts of Academy products Auston Trusty and Anthony Fontana, the guile of new winger David Accam, and the bewildering and mouth-watering assertiveness of Bethlehem Steel product and Jamaican national, Corey Burke. “You only get one chance to make a first impression,” as the saying goes, and these men certainly made theirs. This weekend’s match will be all about another first impression: Borek Dockal. The difference in quality of their opposition will be substantial for the Boys in Blue, but so presumably will be the difference in attacking quality. For all that Fontana brings to the table, it doesn’t yet match the international and Champions League pedigree of the new Union no. 10. C.J. Sapong will likely be under a slightly magnified lens, too, having signed a contract extension this week. For the first time in a long time, fans of the Union will be focusing on the capability of the team’s attack more than that of its defense. The heart of the Union defense held strong in the season opener against New England. However, some of the credit this group is due belongs more to Andre Blake’s go-go-gadget arms and the boundless fountain that is youthful hustle. Zardes, and more broadly the rest of the Crew’s attacking players, will pose a much more significant and intellectual challenge this week. Young players have to prove themselves until they don’t, and these two (particularly as a pair) are still in the former of those categories. Danny Mwanga. Roger Torres. Cristian Maidana. Tranquillo Barnetta. Roland Alberg. These are the players who’ve pulled on the Union’s #10 shirt. Borek Dockal will join these ranks on Saturday. The Union have attacking pieces with national team pedigree at five of their six midfield and offensive positions. They looked dangerous across the field with the keystone piece of that group missing against New England. Adding Dockal into the mix should only push the team’s attack forward. However, missing Anthony Fontana’s tendency to track deep will make for some open spaces and attacking lanes for Columbus. The Union were in rare form with their aggression in Week 1 and it worked. Much like that contest, expect an open affair. Has it been confirmed that Dockal is playing and Fontana is not? Curtin said they will both play as Dockal is not 90 minutes fit yet. Didn’t give away who will be starting though. 3-2; too optimistic. Will be lucky to get a draw. I predict 2-2. 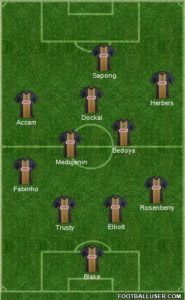 Curtin is a sensible coach, he will start Dockal and see how long he can go, i just hope Fontana will spell him in a mop up situation……..doop doop doop. Fred, now of the academy u-14s as head coach, was the first attacking center mid, wasn’t;t he? Danny Mwanga was the striker, the number 9, I thought. You might be right. Transfer market has a kit history for every club which you can sort by number. I just went with guys in the 10 shirt, not the position. I tried to watch some games last weekend on the MLS site but had no luck. Could not find the stream. What was I missing?